The world of sustainable energy registration just got a bit easier and in (you guessed it) a sustainable way. 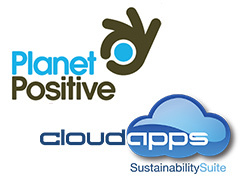 Planet Positive has partnered with CloudApps for an easier sustainability certification process. The worldwide customer base of Planet Positive includes some impressive names such as Land Securities and Deloitte. Customers can now use the CloudApps platform as a basis to drive the certification process of sustainability in an online format. This is another step to make sustainability easy, fast and an affordable method for businesses. The certification process begins online when a business enters their data for fuel, electricity, waste and water. That takes an average of forty minutes. The intuitive CloudApps platform makes data entry easy, creating online sustainability and offers carbon footprint reports. The platform is built on Force.com, which is the world’s most energy efficient platform. They estimate that by year end, Planet Positive will be rolling out the new platform to their over two hundred customers. Planet Positive is based on a philosophy of assisting businesses in the process of sustainability while saving money; the CloudApps partnership simply makes sense. The goal of the partnership is to offer the ability to deliver a larger, more sustained impact on green issues attitudes by businesses. Success for economically sustainable businesses involves the need to be environmentally sustainable. The ability of CloudApps to capture precise metrics will assist organizations around the world in a fast and cost effective manner. When combined with the certifiable brand of global recognition of Planet Positive, it seems like this is a complete win. The partnership will provide both long and short term gains, as the software provides easy and intuitive methods to collect data needed to calculate a typical annual carbon footprint. The system offers the ability to monitor throughout the year and make adjustments which equates to quick cost savings. Posted on May 1st under Global Ecology. Love this article. We live in a fantastic time. At least there is a way for businesses to fix what corporate world has messed up. This sounds like an inventive way to encourage businesses to go green. I am all for it! How cool. I wonder how you can sign up to be a customer of Planet Positive? The era of technology, the internet and the reduction of pollution has finally arrived together. This is exactly the kind of technology that we needed about five years ago. Many then more would have made the decision to reduce carbon emissions and global warming would have been lower than it is today. The CloudApps may be the advent of an entire new generation of green apps, with companies lining up to participate and save money. What a great concept. An algorithm to figure out what your every movement costs to the planet. Sounds like something I should suggest to my company, they are the most wasteful people I have ever met. This would be a great software to offer to the general public. We could monitor every plan and then make adjustments to save on energy.